The most endangered cat in the world, the Iberian Lynx, is also the most threatened European carnivore. Found solely in Iberian peninsula in Spain, the wild cat is likely to be the first to go extinct among feline species. Closely related but smaller than the Eurasian Lynx, the Iberian Lynx weighs in the range of thirty to sixty pounds with a more cat-like face and distinct skin markings than its European cousin. Rest of the attributes, including prominent facial ruff, short tail, longish legs and tufted ears, are similar to other lynx species. A solitary hunter and nocturnal predator the Iberian Lynx relies largely on stealth and stalking to bring down prey. It often lays hidden in wait for hours before pouncing on the hunted animal in as few bounds as possible. Chief prey animal is the rabbit, with birds, rodents and hares less commonly taken. In times of desperation, such as these, when the prey base is thin - deer and mouflons are also attacked and killed by the lynx. The ear tufts aid the cat in locating its prey while thick hair on paws enable it to tread on snow and move silently. Also known as Spanish Lynx, the secretive cat mates at the beginning of the year and cubs are usually born in the months of March and April. Usually three to four babies are born and gain independence at around eight to nine months of age. For much of history, the Iberian Lynx was a part of Spanish fauna and flora - having a marked influence on the ecosystem. Throughout the last century there has been a steady decline in the cat's population, largely due to loss of its main prey animal - the rabbit - to disease. Other elements like roadside kills, poaching, hunting and habitat destruction with the development of Spanish infrastructure have also played a part. Despite warnings by eminent conservationists in the past decades, little government action has been taken to preserve the lynx or its habitat. With nearly one hundred adults remaining in areas the size of pinpricks on the map of Spain - it is now or never for the Iberian Lynx. There is the tiniest flicker of hope with birth in captivity of few of these beautiful cats and some incentive shown by authorities in recent times to protect their reserves in the wild. The situation is still critical though and demands swift and sustainable action if the Iberian Lynx is to survive as a species! I'm doing a project on Iberian lynxes. But how fast is their populaion dropping? I am guessing pretty fast. Cause it used 2 be about 2,000 or o in the whole world , but now there is only about 100 or so . What a crazy world !! i'm doing a project on the spanish lynx. this helps out a lot. i'm doing the niche too. i'm doing a project on this feline also. this helps out a lot on the niche. Yah, I just finished a project on this animal, and this website has probably helped the most! Thnx so much website creater person! I love this website! I'm doing a project on this animal too! But I can not really find a good site regarding their roles in the environment and 5 structural adaptations. So if any of you can help: e-mail me at taytay.fantasy@live.ca thanks! I need this research project done by Oct. 20 HELP! amazing animals!!!!!!!!! sooooo cute!!!! hope we can save them! for my project< i need to know why we should save this animal instead of other endangered animals like the giant panda? I'm doing a research report on the iberian lynx. 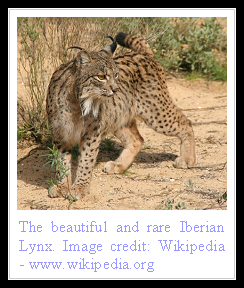 What is the specific niche of the Iberian lynx? I'm doing a project on it. I live in Georgia I went to the trash can the other night. We pulled up I saw a big cat looking, at me from the brush it was grey he looked like a bobcat but different.I've been looking at pictures on the internet. I came across a picture of a Lynx cat I cann't chose what kind it is but I know for sure it's a Lynx cat. What should I do? Please help don't want anyone to hurt him. Thanks for your interest and kindness for the cat. It is probably a Bobcat, since the other lynx species of North America - the Canadian Lynx, is not known to exist in Georgia. Its hard to believe they are extincted! Who would want to kill them? They are to cute to get killed! the iberian lynx also existed in portugal, that's why it's called the iberian lynx and not the spanish lynx. calling it spanish lynx is wrong. some evidence seems to indicate that there may still be some iberian lynx in portugal, though none is actually seen for quite a few years now. i need the role of the ecosystem of the iberian lynx!!! i"m doing a project for school and i was wondering where i could find interesting pictures of the iberian lynx? Thats a very helpful place. Except it doesnt explain its niche at all. And actually Portugal is doing allot to save the Lynx (I remember campaigns & reserves being maide in the 80's to save them). I remember reading that the Lynx was nearly extint in Portugal in the mid 90's, and now they have a slowly growing populatin in the "Malcata Sierra" in Algarve. Spain is also doing a nice & strong effort to save them, so maybe not all hope is lost! What is the Iberian lynx niche?? i am also doing a project on it, this animal is beautiful. aaaaaaaaaaaaaaaaaaaawwwwwwwwwwwwwwwwwwwssssssssssssssssssooooooooooooooommmmmmmmmmmmmmmmmeeeeeeeeeeeeeee!i wish i could donate money stuff like that to help them but my parents won't let me. Doing a project on this. It's a big help!!!!!! i need something on the iberian lynx's adaptations!!! help me! i hv 2 days only!!! Poor lynx! This cat is my choice of asignment.Thanks for the help. Doing a project as almost all of you are. Helpful article!